Binjil Dubais Northern Rivers Sea of Bellies is about connecting pregnant women with important Aboriginal maternity services and fostering a culture of connection and support with local Elders and artists. Binjil Dubais (meaning pregnant women in the Bundjalung language) was launched locally at the Lismore Women’s Festival in 2017. Sea of Bellies first began in Moree in 2004 as a collaboration between Beyond Empathy and the Aboriginal Maternal Infant Health Services. The project linked pregnant women with prenatal health awareness and support, through the art of belly casting. Northern Rivers Sea of Bellies is a collaboration between Beyond Empathy, the Northern NSW Aboriginal Maternal and Infant Health Service (AMIHS), the YWCA NSW and Lismore City Council. 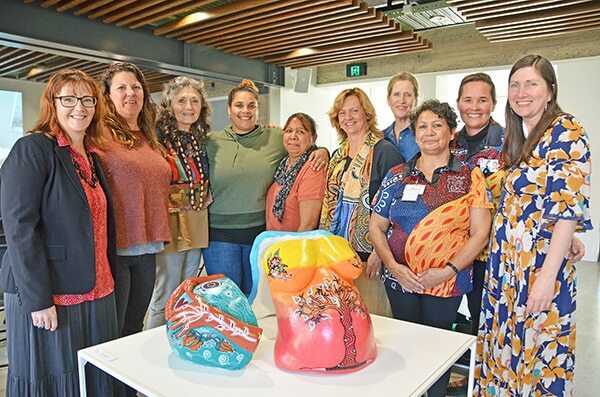 As part of the project, artist Jo Davidson trained local midwives in belly casting and local Elders and artists were invited to paint the belly casts. It is a process in which creating art allows for the sharing of stories and cultural knowledge between mums and the Elders while facilitating access to health and social services workers. Binjil Dubais met every week for a year in the old Lismore Regional Gallery, where young local artist Caitlin Wilmot was employed as a plaster trainee to work on the casts. “The results are just astonishing – not only has this project been hugely positive for the expectant mothers involved, but also for the midwives and artists and all who have helped facilitate the project,” Council’s Partnering and Community Engagement Officer Catherine Rosenbaum said. “It is important to remember that the midwives participation has been above and beyond their normal duties, which demonstrates their strong commitment to the Aboriginal community. The Binjil Dubais Northern Rivers Sea of Bellies exhibition is on display at Lismore Regional Gallery from 6-15 July and entry is free. Image 1: At the launch of Northern Rivers Sea of Bellies today were (l-r) Catherine Rosenbaum from Lismore City Council, Harriet Jobson from Beyond Empathy, lead artist Jo Davidson from Sea of Bellies, belly caster Caitlin Wilmot, Doreen Kelly and Danielle Torrens from AMIHS Lismore, Meagan Laverty from AMIHS Casino, Carmel Kapeen and Bree Forsyth from AMIHS Ballina and Natalie Hill from AMIHS Casino.